Originally uploaded by The User. 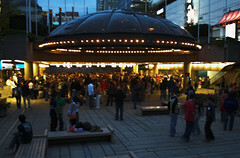 TONIGHT and every Friday night until September 1st, the party is at Robson Square. You see, DanceSport BC’s Robson Square Summertime Dance Series kicks off their 10-week run offering an en masse dance lesson, General Dancing time slots to practice your new moves, and dance demonstrations by local studios. It’s a fabulous way to pick up some basic steps, evaluate the instructors, and get an idea from the demonstrations how far you can take the Dance of the Evening (it’s rumba tonight). The fun begins at 8 p.m. Admission is by donation and a non-perishable food item is very much welcomed. If Robson Square wasn’t already a little pocket of paradise in downtown Vancouver, it is when lit up at night old school-style, with an open dance with experienced couples obliviously flying by the more prevalent newbies. And at 11:30, it wraps up with the Last Waltz. Doesn’t that sound utterly blissful? Count me in. This sounds really fun! Thanks for giving us the heads-up.